The 20-page document, revealed by Japan Times newspaper on Friday, referred to the islands, which are known as Diaoyu in China, with their Japanese name Senkakus. Filed by the Chinese Foreign Ministry, the document describes the disputed islands as part of the Ryukyu Islands, today known as Okinawa. The document was completed in May 1970, nearly seven months after the foundation of the People’s Republic of China by the Communist Party. Japan and China have long been in a dispute over the sovereignty of the islands, which would give the owner exclusive oil, mineral, and fishing rights in the surrounding waters. The dispute reached its peak in mid-September after Japan announced that it planned to buy the islands from their Japanese private owners. Hundreds of Chinese held anti-Japan demonstrations following the move. “The logic behind China’s long-standing claim that the Senkakus are part of Taiwan has now completely collapsed,” he said. Leading experts say Beijing has refused to make the document public because it questions China’s claim on the islands. The assent of an nation under threat of war by militarily stronger powers of that time, of a weak willed or corrupt official, even groups of officials cannot over-rule facts as above listed. Militarist basis of claims by Japan still fails. Consider also that China being able to overrun Japan now, could also claim that the whole of Japan is Chinese territory. But the Chinese all know that the Japanese are a sovereign people. Think and apply. If military power is the basis of Japan’s claim over the Chinese during a moment of weakness, then Japan is currently in a moment, nay, potentially an Aeon of weakness, does that mean that China has any right to claim the whole of Japan as it’s own? What if China BRIBES every Japanese politician with a Singapore sized microstate each to sign over Japanese sovereignty to China to become part of the again rising Chinese Empire? Would the decision of a handful of officials override the will of the Japanese people at large? So same with the officials who recognized Japanese control of the islands via a single document UNDER MILITARY DURESS. Were China equal in military power to Japan, never would the officials accepted the 1950 drafted 20 page document. These are ETHICAL considerations not based on military power (which China is superior in anyway as of now) which automatically still maintains that the islands beling to China and not Japan. The logic behind China’s long-standing claim that the Senkakus are part of Taiwan still stands, it is Japan’s ethics and principles which has collapsed. Considering that Press TV looks like an Israeli media setup (if not an Arab false flag intended to destroy relations between China and Israel), Israel’s (or the Islamists?) ethics and principles, and diplomatic standing with the Chinese might have also collapsed as well. NANJING, Jan. 17 (Xinhua) — Former Japanese Prime Minister Yukio Hatoyama on Thursday apologized for Japan’s wartime crimes in China and expressed his hope that the tragedy would not be repeated. Hatoyama made the remarks while touring the Memorial Hall of the Victims of the Nanjing Massacre by Japanese Invaders in the eastern Chinese city of Nanjing. Hatoyama was the third former Japanese prime minister to visit the memorial after Tomiichi Murayama and Toshiki Kaifu. During the visit, he often stopped to pay silent tribute to photos or the remains of the victims of the Nanjing Massacre, which was committed by the invading Japanese army in the late 1930s. Hatoyama nodded as Zhu Chengshan, the memorial’s president, told him that it is an undeniable fact, as stated in the verdicts of the Tokyo and Nanjing martial courts, that Japanese invaders killed more than 300,000 people in Nanjing. “The Japanese government had made it clear when signing the Treaty of San Francisco 1951 that it accepted the verdicts of the Far Eastern International Military Court of Justice and others verdicts regarding its war crimes,” Zhu said. After seeing slogans reading, “To remember the historical lesson of Nanjing, but not for revenge, and to seek eternal world peace for great love,” Hatoyama said the words touched him and he hopes that all people will work hard for peace. “After the tree of peace I planted blossoms and bears fruits, I will come back again,” he said at the end of a two-hour visit when he planted a ginkgo tree in a park. 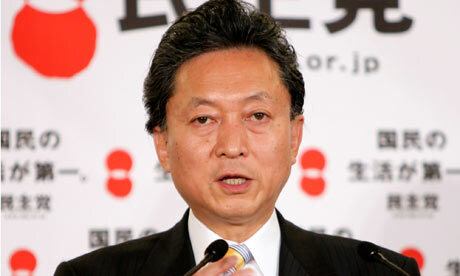 Hatoyama, 66, served as Japan’s prime minister between September 2009 and June 2010. Hatoyama can be the good cop n the background while a short war to confirm China’s ownership over disputed territories occurs. Would Hatoyama prepare to lead a post 2013 war government by first initiating the names of removal of all Class 1 War Criminals at Yasukuni Shrine for a start? 1 Claimed province: The People’s Republic of China claims the island of Taiwan and its surrounding islets, including Penghu, as “Taiwan Province”. (Kinmen and the Matsu Islands are claimed by the PRC as part of its Fujian Province. Pratas and Itu Aba are claimed by the PRC as part of Guangdong and Hainan provinces respectively.) The territory is controlled by the Republic of China (ROC, commonly called “Taiwan”). 4 Invited provinces: On behalf of The People’s Republic of China ICCR has conceptualised the concept of the ‘Invited Province‘ : ICCR informally invites the nations of Japan, Phillipines, Myanmar, Vietnam and Mongolia to ‘unify’ with the closest provinces of Shanghai (Japan), Taiwan (Phillipines), Yunan (Myanmar), Hainan (Vietnam) and Inner Mongolia (Mongolia) respectively for a better Imperium.